I recently watched a documentary on Netflix called Steak Revolution. It followed a French butcher on a world tour of the most famous and luxurious of beef producing regions. For an hour, I was treated to views of Peter Luger T-bones, Kobi beef hibachi, Argentinian BBQ, and Tuscan beef festivals. I learned that most American steaks are killed below the age of two, whereas a Spanish beef producer will raise a steer for up to 13 years, until they are monstrous beasts. It was quite fascinating and left me desperate for a steak. I was headed down to Devon that weekend though, so needed something more portable than a rare T-bone. 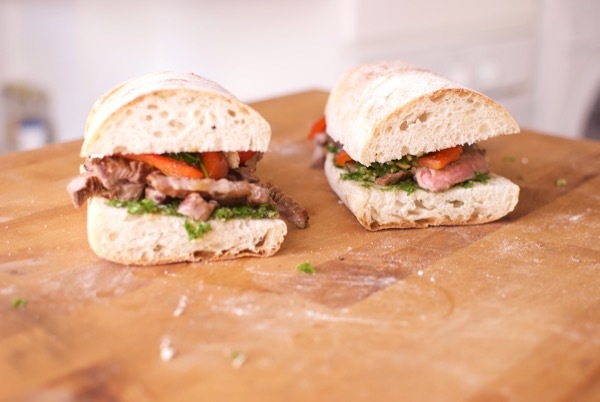 Steak sandwich it is. 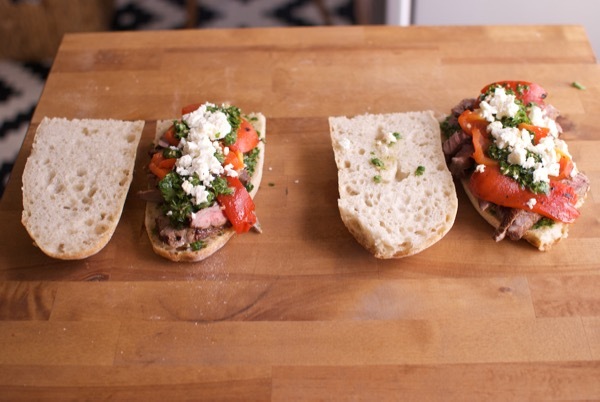 I was raised next to Philadelphia so understand well the majesty of a cheesy steak sandwich, though this version is much, much fancier than that. 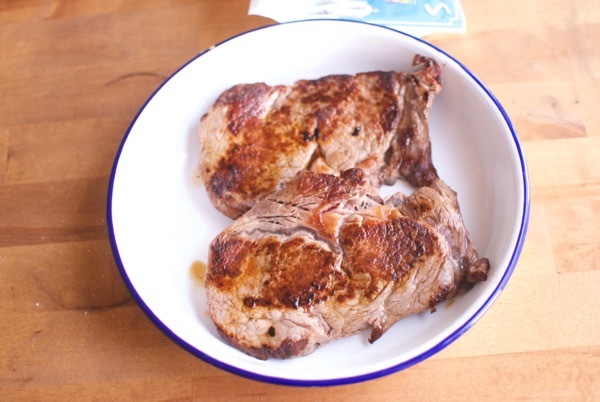 A happy butcher on Essex Road was able to provide me with two rib-eye steaks, about a 1/4 inch thick each. I had fresh herbs and a pepper to hand, and some feta. I wanted a really juicy satisfying sandwich so decided to make a dressing out of the herbs and roast the pepper for more flavor. In retrospect, instead of feta I would have used a Provolone or even a yogurt (my favorite) garlic sauce. The feta did provide a nice saltiness but was a bit dry. I cooked the steak a bit more well-done than I usually do, mostly because I got distracted with roasting the pepper over the open flame. I think you just need three minutes on each side in an insanely hot cast-iron pan. This created a great crust on the outside, but keeps the inside rare. I also now know for a fact that my smoke-alarm works. This produced two huge sandwiches. Pulling these sandwiches out halfway through the five-hour drive down to Devon on a chilly, Friday night made the trip a lot more bearable, even with a surfboard shoved up against me. I imagine in a nice park on a Summer's day would be an even better location for the recipe below! Bring the steaks up to room temperature and salt both sides really well with kosher or flaked salt. While they are coming to temp, put a cast iron pan on the stove and turn on high-heat. It will take about 6-7 minutes for it to start smoking. You can add a dash of oil if you like. Put the steaks in the pan (carefully) and open a window and turn on the fan. This is where things get smokey. Do not touch the steak for 3 minutes. Flip for another three minutes and then transfer the steaks to a plate and don't touch them until everything else is done. They are tired and need to rest. 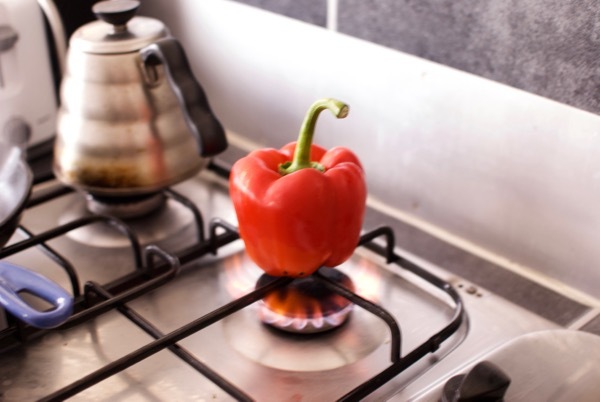 Put the pepper in an oven set to broil, or over an open gas flame. You can see how I did this above. 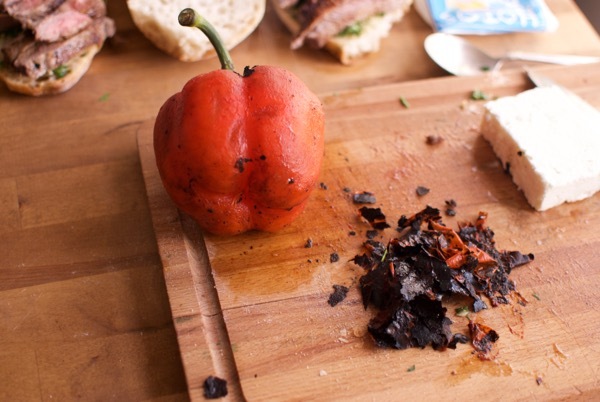 Turn the pepper until all sides are charred black. Stick in a plastic bag and place in the freezer for five minutes. You can then scrape the charred black skin off and slice into strips. De-stem the parsley. Pack it into a food processor with the garlic, vinegar, lemon juice and oil. Add a generous pinch of salt and ground black pepper. Blitz until it's smooth. 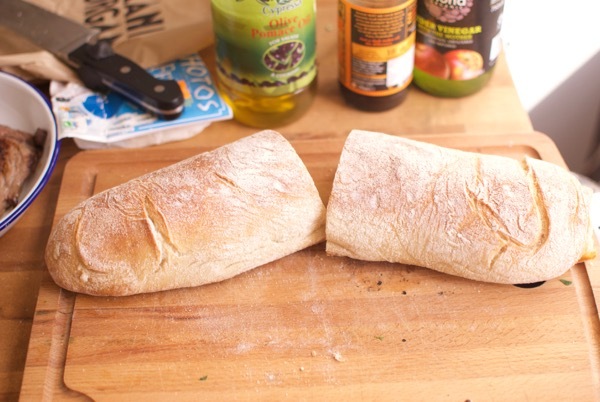 Toast the bread and rub with a sliced clove of garlic. Slice the steak and layer on the bread. Layer dressing, peppers and feta or yogurt on top. Squash down and wrap very tightly with foil. Try not to eat it too fast.